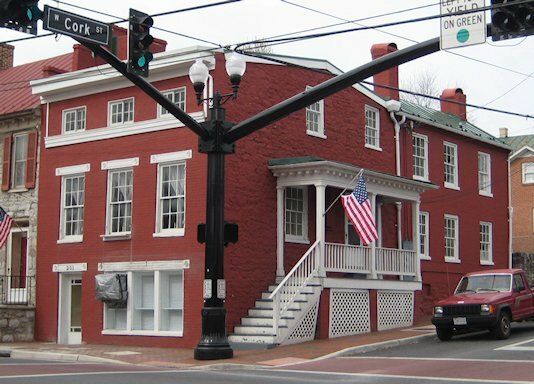 As you saw in part 1, the Samuel Noakes house had been adapted to one commercial space in a sub-first floor area facing Braddock Street and two apartments in the main body of the house, one upstairs and one downstairs. Layers of changes had accumulated over the years, leading to blocked stairs, blind alleys, and inefficient use of space. John had contemplated pursuing historic tax credits for this project. However, he found his goals for the property did not mesh well with the historic tax credit process. This is fine; not every property can or should be a tax credit project. He took the right approach in consulting with the Virginia Department of Historic Resources before beginning any work on the property to see if it would work for him. It did not, so after a trip to the local Board of Architectural Review for the Certificate of Appropriateness for exterior changes, he was free to then begin work. He started with some selective demolition to see what is under the layers of changes. Stay tuned for the next installment on Tuesday for more detail photos, interior photos, and video walkthroughs.